Let’s explore lower-cost wedding alternatives. Here, you’ll find ways to have the best wedding on a budget. This is a great option for daytime weddings, 12-4p.m. You’ll get lunch, champagne toast, chiavari chairs, your wedding cake. And it’s a great deal, starting at only $30 per person. This means you can have a reception for 100 guests for under $4,000! Receive a complete, all-inclusive ceremony and wedding reception package for $7,500: Your Wedding Ceremony, All Decorations & Your Choice Color Uplighting (yes, this is one of our FABULOUS ceremonies, with lighting, draping, pillars, etc. valued at up to $3,500 for ceremony alone). Then enjoy your wedding reception: up to 100 guests (additional guests may be added), Dinner Included, Open Bar for 4 Hours, Your Choice Color Uplighting, (Two-tier package as featured in our Premium Wedding Package), Backdrop For Your Your Head Table, Wedding Cake, Ceiling Draping, Chiavari Chairs for Ceremony and Reception, Premium Centerpieces for all Tables (Includes Crystal Collection) VALUED AT $13,500, so you would be saving $6,000 by having your wedding during the week. Get 10-15% off, as well as lower minimums for private venue bookings, for your Friday or Sunday Wedding. Packages start under $50/person, including, dinner, open bar, wedding cake and wine service. So why not consider a Friday or Sunday Wedding? You can save money by having your wedding before the Chicago wedding season begins. Get discounts, December – March, November and April. Double discounts on Fridays and Sundays during the winter months mean that you can get a wedding package under $40 per person, that includes the venue, dinner, open bar and wedding cake. So if you’re planning an off-season Chicago wedding, just request an appointment for a custom-quote to fit your wedding budget. We love helping couples stay within budget, while getting the wedding of their dreams! 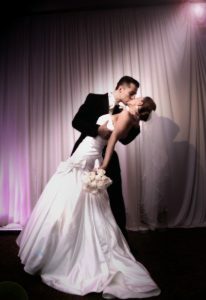 You’ll receive discounted hotel accommodations for you and your guests and free shuttle service with all wedding packages. Plus, you’ll get a dressing suite onsite.